Father John Aedan McKeon, O.P. Father John Aedan McKeon, O.P., died peacefully on the late morning of Friday, January 18, 2019, at Mount Saint Rita’s Health Centre, Cumberland, RI, at the age of 89. Fr. McKeon faithfully served the Church as a priest for over 60 years, serving at St. Pius V Parish in Providence, RI, St. Stephen Priory in Dover, MA, and as a preacher for many years. He is survived by his sisters, Sr. Margaret McKeon, S.C., and Sr. Ann McKeon, S.C., and several nieces and nephews. His brother, Mr. Martin McKeon, and his sister, Mary McDonough, predeceased him. Father McKeon was born October 14, 2929 in Dorchester, MA, to Bartholomew Joseph McKeon and Bridget Barbara (née Foley) McKeon and named John Joseph. He attended St. Margaret School in Dorchester and St. John’s High School in North Cambridge, MA. He was accepted as a preparatory student for the priesthood in the Dominican Order at Guzman Hall, Providence College, Providence, RI. He entered the Dominican Novitiate in August 1949, at St. Rose Priory in Springfield, KY, and received the religious name Aedan. He made his first profession at St. Rose on September 15, 1950 and his solemn profession at The Dominican House of Studies, Washington, DC, on September 15, 1953. He studied philosophy at St. Rose Priory and St. Joseph Priory in Somerset, OH, followed by theology at the Pontifical Faculty of the Immaculate Conception in Washington, DC. On June 8, 1956, he was ordained a priest at St. Dominic Church in Washington, DC, by Most Reverend Edward Celestin Daly, O.P., Bishop of Des Moines. In 1957, he was assigned to St. Dominic Rectory in Detroit, MI, and served in the parish. In 1959, he was assigned to St. Stephen’s Priory in Dover, MA, and became a member of the province’s Preaching Band. In 1960, he was assigned to St. Pius V Priory in Providence, RI, and remained on the Preaching Band. On February 9, 1965, he became prior of St. Pius Priory and was appointed pastor of St. Pius V Parish. After serving for prior for two terms, on April 27, 1971, Fr. McKeon was assigned to St. Thomas Aquinas Priory at Providence College and appointed Director of the College Union. In 1973, he returned to St. Stephen Priory to begin retreat ministry. In 1975, he was appointed Provincial Coordinator of Directed Retreats. On September 1, 1978, Fr. McKeon was assigned to St. Vincent Ferrer Priory in New York, NY, to work in the Spiritual Life Center of the Dominican Center of Evangelization. In 1980, Fr. 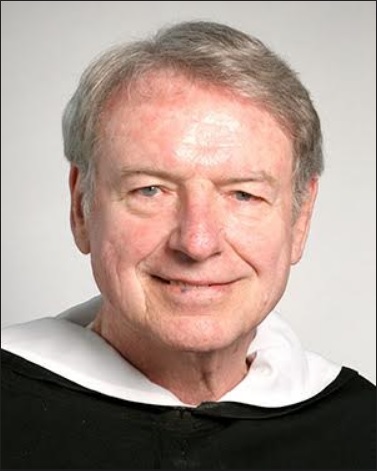 McKeon was appointed Provincial Secretary for Preaching and formed the Dominican Preaching Team of Mariandale, a collaborative team of Dominican friars and sisters, residing with the Dominican Sisters of the Sick Poor in Ossining, NY. In 1997, he moved to Sparkill, NY, on the property of the Dominican Congregation of Our Lady of the Rosary. He remained active in retreat preaching, parish missions and spiritual direction up until the last few years of his life. In September 2018, Fr. McKeon moved to Mount St Rita Health Care Centre in Cumberland, RI. Fr. McKeon‘s body was received at St. Pius Church on Tuesday, January 22, 2019. The Office of the Dead was celebrated there at 7:00 pm. A Mass of Christian Burial was celebrated for him on Wednesday, January 23, 2019, at St. Pius V Church at 10:00 a.m. Very Rev. Ken Letoile, O.P., Prior Provincial, was the principal celebrant and preacher. His body was laid to rest in St. Francis Cemetery, Pawtucket, RI.